Leopold Stokowski was the last of a long line of great conductors of the past century. To him, as to Furtwängler, Beecham, Barbirolli, and even Toscanini, the score was where you began, and not an end in itself. This line stretched back into the 18th century in the likes of Richter and even Wagner. When you listen to Stokowski you hear a musician and not just a conductor. We shall never see likes of Stokowski, or the others, for better or worse, again. 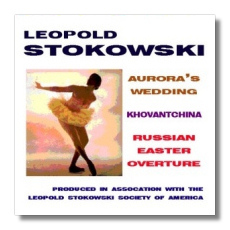 Stokowski Symphony Orchestra… sometimes called Leopold Stokowski Symphony Orchestra. The name varied somewhat, and the players did, too. HIS SO included the top orchestral players in New York in the late 40s and early 50s. Robert Bloom played oboe, Juliet Baker on flute, Leonard Rose and Bernie Greenhouse played cello, Walter Trampler was on viola, Mason Jones, horn, and solo violin was either Oscar Shumsky or Mischa Mischaokff. Even Mitch Miller, later of "Sing-a-long" fame, played English horn on occasion. This roster was joined by other players from the New York Philharmonic and NBC Symphony Orchestra as this ad hoc orchestra, organized specifically to record for the Maestro. Using tape, from which the Tchaikovsky is taken on this disc, and the latest technologies, Stokowski transformed an orchestra of 24 strings to sound like 68! He separated and individually taped some of the orchestral sections, added reverb to the recordings, and of course used his famous free bowing to add a legato-like sound. When you listen to these recordings, all made in 1953, you will hear what I am talking about. Listen to the solo violin, horn, and flute at the opening of The Russian Easter Overture, the atmosphere set is haunting. Another "innovation" in this piece has the trombone recitative, depicting the priest's chanting during the Divine Service of the Russian Orthodox Church at Easter, sung by the baritone Nicola Moscona. Stokowski had used this idea in 1942 with the NBC Symphony Orchestra (available on Cala CACD0505). I have to tell you that it does sound more "Russian" as a result. In fact, of the four recordings made (a live one with the Lucerne Festival Orchestra might be found if you are lucky and there is also a rehearsal, also with baritone, with the San Francisco Symphony… also rare) this is my favorite. The main item on this disc, however, is the Sleeping Beauty music, as arranged by Diaghilev, and nobody, but nobody does Tchaikovsky ballet music better than the "Old Magician" (and he was in his young 70s by now). A 1947 recording has already been released by Cala (0522). This 1953 recording was previously issued on the Iron Needle label, but that was obviously taken from an LP, you can even hear the LP swish as it is played. Now you can hear it in its full glory and it is impossible to believe that the orchestra is so small, in fact it sounds fuller than the NBC Symphony Orchestra. Bob Bloom once told me that frequently the orchestra would arrive, not sure what was to be recorded. Thus rehearsals and recording sessions were simultaneous. This brought a certain élan to these recordings, an improvisational experience. Add the Mussorgsky to the mix on this release and you have an indispensable recording, and not just for Stokowski fans, even though it is as much his music as that of the composers. By the way, I wrote the notes for the disc and agreed to have the society's name appended to the disc. I am not, however, in any way financially associated with the disc, nor is my review slanted as a result. In fact, after I had written a rough draft of the review I suggested to Mark that he might want to use some of it for notes. In return, I did not have to pay for my review copy.